Foxboro, MA—June 2,2018—A short staffed New York Red Bulls team put forward a valiant effort but fell 2-1 yesterday against the New England Revolution. Gillette Stadium has often been a house of horrors for New York but was even more difficult with several key players out of the team. Jesse Marsch had the challenge of replacing three regular starters who were called into their respective national teams, Tim Parker and Tyler Adams for the United States and Michael Murillo who will represent Panama at the FIFA World Cup in Russia. In addition, Daniel Royer was put on the bench to keep him fresh for New York’s U.S. Open Cup match against NYCFC on Wednesday. The opening minutes were very even between both sides who both play an athletic and high-pressure style. It would be one of the replacements off the bench who would get the first opportunity for the Red Bulls, as Vincent Bezecourt rattled the woodwork from a freekick from the center of the field which was tipped initially by the New England keeper and New Jersey native Matt Turner. However, the visitors would break the deadlock just a minute later when Bradley Wright-Phillips send a header past Turner from a brilliant cross by Sean Davis from the right wing. The goal was Wright-Phillips’ ninth of the season, putting him tied for second in the league in scoring. The Revs would nearly equalize just a couple minutes later when Kelyn Rowe fired a low shot that was parried away by Ryan Meara who started for the third straight game in place of an injured Luis Robles. The majority of the half, and the match for that matter, then became what most games on the artificial turf at Gillette develop into: a chaotic series of long balls and hopeful passes that often skip away or bounce high on the unforgiving surface. Both teams had significant trouble gaining any significant possession or attempts in the final third. Ryan Meara made a key save in the 27th minute shutting down forward Teal Bunbury from close range on a breakaway. 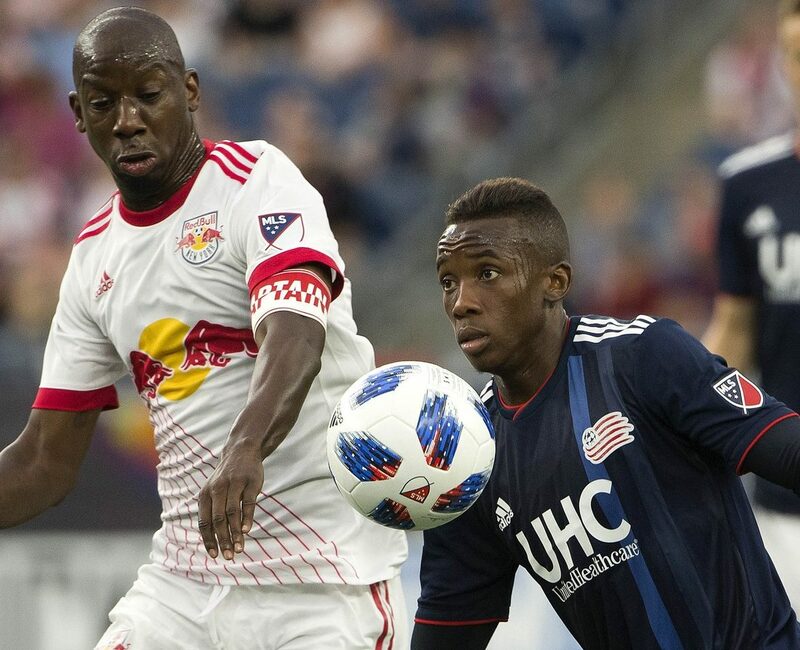 In the 36th minute the Red Bulls nearly equalized when Wright-Phillips nearly missed a low cross in the six-yard box from Derrick Etienne Jr. who was back with the team after representing Haiti in their recent international friendly against Argentina. The hosts would draw level just before halftime when danger man Diego Fagundez was left wide open and fired a half-volley shot past Meara in stoppage time of the first half. The Revs would ride the momentum into the second half as the physicality picked up from both sides. But it would be Derrick Etienne Jr. who would get the first good opportunity just minutes in to the second half firing a shot from outside the 18-yard box into the arms of Turner. The match then became a choppy affair with neither team seemingly getting anything productive for their efforts. Around the 60th minute, New England turned up the pressure on New York, and appeared to earn a penalty kick which were waved away by the referee. The pressure put on the Red Bulls backline finally had the desired effect in the 77th minute when the veteran Teal Bunbury buried a tap-in past Meara to put the Revs in front 2-1. New York forced pressure of their own in the final ten minutes, in a game that became much less about style points and more into a ugly fight to the finish. New York was not without its opportunities, earning several free kicks in the last few minutes, but to no avail as New England took all three points ending the Red Bulls streak on 5 straight games without a loss. All attention now turns to the U.S. Open Cup on Wednesday, the United States knockout tournament which includes teams from Major League Soccer down to amateur sides. The Red Bulls debut in the 2018 competition will be a rematch of last year’s fourth round against rivals NYCFC at Red Bull Arena at 7 PM. Last season the two sides played a very close match which was won by a strike by Daniel Royer which started New York’s path to the final where they lost to Sporting Kansas City. But this year an already shorthanded side will be even more depleted. In addition to being without Adams, Parker and Murillo, Jesse Marsch will also be without MLS assist leader Kaku who will represent Paraguay in their international friendly match against Japan. There were some bright spots on the depth front though for New York as German international Marc Rzatkowski, on loan from Red Bull Salzburg in Austria, came back from injury late in Saturday’s game. Another reason for optimism was the news that regular starting goalkeeper will be back in the lineup this week either in the Open Cup match Wednesday or in the next MLS match Saturday at Columbus. Any additions will be more than welcome as the dog days of summer begin in earnest and where quality down the depth chart will be essential to New York’s success.